Born and raised in Texas from German descent, his parents quickly learned how to fuse traditional German cuisine with traditional Texas cuisine. Marcus’s love for cooking began at a very early age. Over the years, has worked in restaurants both front and back of the house while attending culinary school. He found his home at the iconic Adolphus Hotel, where he spent a greater portion of his culinary career working for and alongside many culinary greats. As a mentor to many students, he encourages the future chefs to blend the knowledge of food and wine. 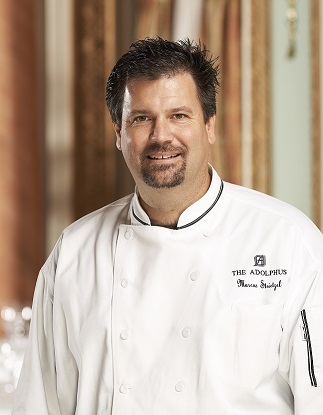 Serving as the Executive Chef for The Adolphus he has had the pleasure of preparing meals for many political officials, dignitaries and executives. Now as Corporate Executive Chef for Crescent Hotel Group, he has the opportunity to work with a diverse group all over the country. Not only has this been a very rewarding time, it has allowed him to develop and compile a database of regional cuisines. Marcus finds great satisfaction in being a part of creating, recreating menus and mentoring culinary talent with fresh approach to food. Erin was hired as Executive Chef at The Medical Center of Plano in April, 2016. She left her previous position as Executive Sous Chef at Northwood Club to bring culinary creativity to MCP. Salamon has traveled throughout the U.S., working for multiple properties of Discovery Land Co., high-end, private golf club properties. After working for Discovery Land Co., Salamon was the Executive Chef for Limited Brands in Columbus, Ohio for two years. She was offered the Executive Sous Chef position and at Northwood Club in Dallas in 2013. Salamon attended Scottsdale Culinary Institute in Arizona in 2001. Currently, Salamon is working to complete her Bachelor’s in Health and Wellness, with the focus on Nutrition. Her goal is to continue her education and pursue a Master’s degree in Nutrition to better serve the patients receiving care at MCP. Eating naked is the philosophy of the Naked Chef, Jacques Laventur​e​, from MTV's Snack Off and the 14 Minutes Snacks Cook Book. 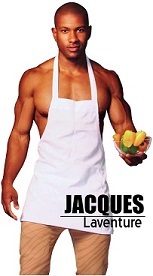 Jacques, also known as Fitness Joq, does tend to cook somewhat naked,but not completely. He just happens to wear nothing on top except an apron. However, he was initially called the Naked Chef as he explained that his way of cooking was to strip everything down to the basics of cooking. Laventure’s newest concept in Dallas packages his expertise in cooking and fitness in what he calls a “one-stop shop” for wellness. The JOQ Wellness Center, tucked inside the ground level of the Mosaic Dallas building, will include a sit-down restaurant, fitness gym, event space, and more. Executive Chef Vik Katoch oversees banquet and restaurant operations at the Hilton Granite Park Hotel including the hotel’s adjoining restaurant Carso Mediterranean Grill. Katoch brings 27 years of culinary experience, most recently working with Hilton Worldwide at Hilton Saratoga, Waldorf Astoria Orlando and Hilton San Diego Bayfront. Katoch holds a certified culinary diploma from the Institute of Hotel Management Catering Technology and Applied Nutrition in Hyderabad, India. He also attended Johnson & Wales University in Miami, Florida and completed a marine hotel management training program in St. Thomas, U.S. Virgin Islands. Chef Santin trained at the L’Ecole Le Notre in Paris, Zurich, and Toronto. With over 30 years of experience, his culinary travels have taken him to Bali, Saudi Arabia, Jakarta, Bangkok, Singapore, Dallas, and Las Vegas. Prior to moving to Las Vegas as Mandarin Oriental Hotel’s Executive Pastry Chef, Chef Santin was the Executive Pastry Chef at Rosewood’s Crescent Court where he was awarded Pastry Chef of the Year in 2006 by the Texas Chefs Association and Hotel Chef of the Year in 2007 by the Hotel Association. Chef Santin is excited to bring his unique vision to Dallas, which he has always called home. Ben Maulsby is the executive chef at Dallas’s largest, top-performing patio bar and lounge, Happiest Hour in the HARWOOD District. Maulsby leads the high-volume kitchen with an emphasis on quality locally sourced ingredients to deliver delicious flavor with a kick in every dish. He also portrays his creative culinary technique in dishes on both the regular menu and the newly introduced #ButFirstBrunch menu. These include the light Chicken Lettuce Wraps, the Croque Monsieur Sandwich with jalapeño mornay, and the decadent Sugar Rush Hot Cakes with hazelnut chocolate pebbles and blueberry compote. Maulsby started his career as a cook at the Hilton Anatole’s famous Nana restaurant as a cook under legendary Chef Anthony Bombaci. When Nana’s chapter closed in 2012, Maulsby worked as sous chef to chef Anthony van Camp at the Hilton’s SĒR Steak+Spirits. He continued to perfect his craft alongside van Camp for 3 years before being promoted to executive sous chef of the Hilton Lincoln Centre Dallas. Chef Donald Chalko started his career at the prestigious Mansion on Turtle Creek with Chef Dean Fearing at the helm. He quickly worked his way up and moved on to the French Room at The Adolphus Hotel under Chef Jason Weaver. There he stayed and worked through the ranks becoming the Banquet Sous Chef and finally ending back in the French Room as the Sous Chef. From there he moved to Las Vegas, Nevada and helped open the Mandarin Oriental, Las Vegas with Chef Jason Weaver. There he held the position of Banquet Chef and helped them become a 5 Diamond hotel. After a 2-year stint he relocated back to Dallas to the Omni Dallas to become reacquainted with Chef Jason and holds the position of Executive Sous Chef. Chef Donald graduated from Austin College in Sherman, Texas with a Bachelor of Arts in Communication Arts and Visual Arts. He is married to Darby Chalko and has two daughters named Greer Ryan and Maris Grey. AWARDS, HONORS AND SOCIETIES—THE FRENCH ROOM AT THE ADOLPHUS HOTELThe 2006/2007 Zagat Survey named it the #1 hotel restaurant in America, score of 29-29-29. The highest rating of any restaurant in the United States. We produce Traditional Balsamic Vinegar of Modena P.D.O. and Condiment. This may seem simple, but these few words cannot fully convey the Balsamic experience. So much more is held within those letters: a wealth of wisdom, ancient crafts, unique flavors...with just one ingredient: grape must. In our dark and silent ageing room, durmast oak, acacia, cherry, juniper and chestnut barrels imbue our balsamic with their precious aromas with the slow passing of time. Year by year, through Modena’s sweltering summers and the cold winters, our balsamic ripens following the tradition we inherited centuries ago, developing the savor and bouquet that make it unparalleled worldwide. Leon has been at Medical Center of McKinney a little over 7 years. Having made his start in country clubs, this is Leon’s first hospital. After working at Southern Hills Country Club for 16 years, where he learned everything from fine dining and banquet to off-site catering, he obtained his ACF Chef Certifi­cation.